T.Z. Chu, ‎Retired CEO of Aurora SFC Systems Inc. and Co-founder of Finnigan Corporation; excerpted from an online interview with the National Museum of American History, January 3, 2016. I was born in Shanghai in 1934. My father was Chinese and my mother was Japanese and they were married in 1930, when the two countries were at war. 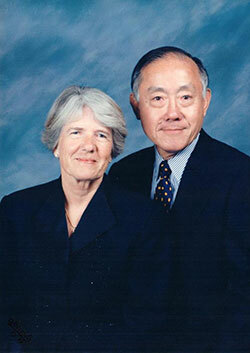 They met when my father wanted to learn Japanese and was introduced to my mother as his teacher. The Chu family had a well-established multi-generational history in the domestic and international silk business. In the late 1920s my father returned to China from Europe where he had been learning about the textile industries. He settled in Shanghai and launched a textile weaving and dyeing company that had a substantial export business. Our family was forced to leave Shanghai at the end of 1948, as did most well-to-do families, when the communist army was advancing toward the city. We settled in Bombay (now Mumbai), India, and [my parents] eventually moved to Bangkok, Thailand to launch an international trading business. However, they had earlier enrolled my two sisters and me in Woodstock School, an American boarding school in India. We remained there until my older sister and I graduated. In retrospect, my time at Woodstock School had a significant impact on my career and me. I was never conscious of being a minority member at the school and later in life. During my senior year, I served as the student body president and was granted the Best All-Around Student Award at my graduation. I was accepted by Berkeley as a chemical engineering student, but switched my major to physical chemistry. It was a difficult economic time for my parents and they were not able to financially support my education at Berkeley. However, I was able to pay my own way through school by working as a union-member laborer during summers at a Del Monte fruit cannery and working for the math department. Working as a laborer at the cannery was also a major contributing factor for my education. I was the only Asian worker at the cannery but I was given increasing responsibilities and eventually put in charge of quality control – a job never given to a union laborer before. I also learned to understand and appreciate the sentiments of the blue-collar workers (mostly Portuguese immigrants) which also subsequently served me well in my career. After graduation, my first job was with a start-up company manufacturing gas chromatographs, then a significant new and powerful analytical instrument. I was offered the job as the company’s first applications chemist, literally working in the founder’s garage. My responsibilities were to communicate with existing and potential customers, demonstrating how to use gas chromatograph to address their specific analytical needs. The company grew quickly and before I realized it, I was de facto put in charge of marketing and sales and later assumed responsibilities over R&D and manufacturing as well. In 1962, the US administration lifted the restrictions that had previously prevented any Chinese who majored in sciences and engineering at US universities and colleges from leaving the US. I visited a number of European chemical companies and government research laboratories, which were interested in using gas chromatographs. When I returned home, I persuaded my boss to set up a European operation to market the instrument. He agreed on the condition that I would move there to implement and manage it. I arrived in Basel, Switzerland, the center of Swiss chemical and pharmaceutical industries, in the spring of 1963, with two suitcases and went to work hiring employees and setting up subsidiaries in several major European countries. I was only one of two Asians working in Basel when I arrived. I met my wife Irmgard Suetterlin in Basel. It was a rapidly developed romance and we were married in December of 1963. The rapid growth of the company attracted significant interest from large corporations. When I was in Europe, the company was acquired by Varian Associates, then a major technology company based in Palo Alto, CA. I assumed the post of general manager of the newly acquired division [which] made me the youngest vice president of the company. A year later, Varian asked me to also assume responsibilities over another instrument company it had acquired based in Melbourne, Australia. I commuted between California and Australia every month for about two years, until I resigned to join a young company, Finnigan Corporation and assume the role of CEO. Throughout my career, 12-hour days were the norm, since I lived and worked in California and had to be in touch with our European operations in early mornings and Asian operations in evenings. The working experience I gained and the broad responsibilities given to me while attending university and during the early stages of my career were incredible gifts. The lack of consciousness I gained during high school, university and in the industry to being “different” as a member of a minority race was also an incredible gift. Only because of those gifts was I able to become the first Asian CEO of a public technology company in America – a country that values meritocracy rather than family background. I identified myself as an American well before I became a citizen of the United States, whereas my wife identifies herself as a Swiss and has never changed her citizenship. It has never been an issue for us, but we did make sure that our daughter was born in America. I think I have identified myself as an American since my high school days at Woodstock School in India, where most fellow students were Americans and almost all went on to attend colleges in America. I have always been interested in reading about American culture, politics and economics. I felt quite at home wherever I was - whether in Asia, Europe or America. I have served on company and institution boards in all of these regions. On the other hand, I take my American citizenship very seriously and always voted in local and national elections. I always took special interest in supporting educational institutions at all levels and have served for over a decade on the board of Woodstock School and as a trustee of University of California Berkeley Foundation, among other schools and supporting organizations. To me, success is measured by whether the contributions I made during my career had a lasting positive impact on the world. I am most proud of the fact that a number of individuals who worked for me became successful leaders themselves of companies and institutions. Identifying, encouraging and nourishing talents in others are the most satisfying reward of any job. I would advise future generations to always keep the best interests of their succeeding generations in mind. Don’t focus on realizing immediate personal gain, but try to figure out how to leave behind a better social environment for succeeding generations. I sincerely believe providing the opportunities for a good education is the key and we all can do something about that. An unedited transcript of this online interview is available for scholarly research through the Archives Center of the National Museum of American History. Ching dynasty incense bowl, Chu’s parents brought with them as they moved around the world from China, to India, to Thailand, to Morocco, to France, and finally to the United States.